Process gas analyzers, nonextractive sampling, single and dual channel devices for H2O, Hydrocarbons and Carbon Dioxide gas vapors. Infrared sensing technology. Capable of continuous monitoring for gas vapors. 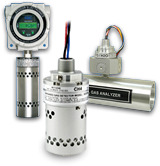 These process gas analyzers are unaffected by humidity and pressure. Patented self-compensating optical bench. Fast response time. The sterilization infrared gas analyzer measures infrared light absorption due to molecular resonances. The infrared gas analyzers are tuned to the infrared signature of the target gas or vapor, measuring light at wavelengths absorbed by the target gas and at wavelengths not absorbed by the target gas. The gas concentration is determined by calculating the ratios of the analytical and reference levels. Embedded linearization algorithms keep the output accurate over the entire measuring range and embedded compensation algorithms maintain measuring accuracy over changing environmental conditions. 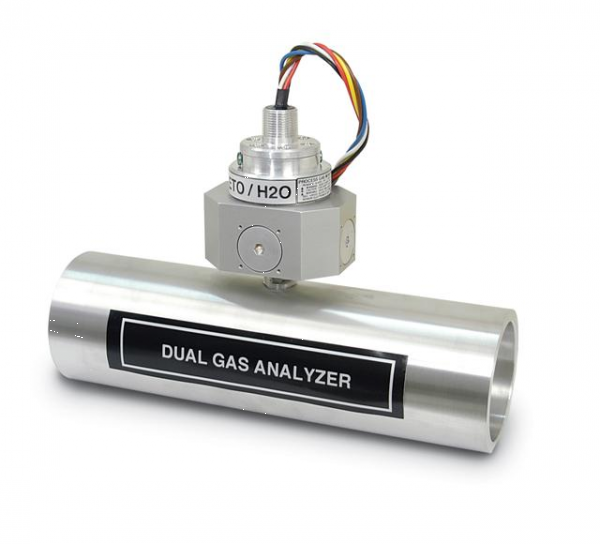 This optical gas detector has an industry standard analog output provides complete remote alarm, fault and calibration signals. The analog output from the device can be connected to chart recorders, data acquisition systems or a process control system.